Edward Cheung, long-time principal engineer for the Hubble Space Telescope Development Project was recently dubbed Knight of the Royal Order of the Netherlands Lion. 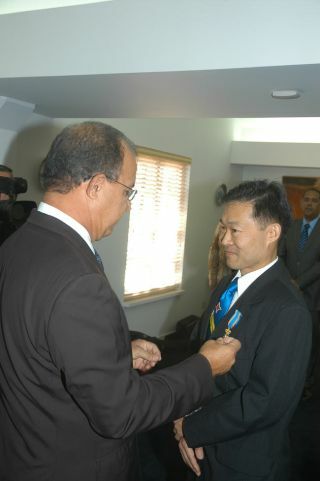 In this picture, the Governor of Aruba, Fredis Refunjol, fastens the royal decoration to Cheung’s jacket. Along-time NASA engineer working on the Hubble Space Telescope ?is now afull-fledged knight in the Netherlands due to his work to help keep therenowned 20-year-old space observatory in working order. EdwardCheung, an engineer who develops electrical systems and solutions for the Hubble Space Telescope, was knighted on June 12 by Queen Beatrix of theNetherlands, in recognition of his accomplishments on Hubble and his work ineducating the youth of his native Aruba (an island country belonging to the Kingdomof the Netherlands). Cheungnow lives in Greenbelt, Md., where he works at NASA's Goddard Space Flight Center. He joined the Royal Order of the Netherlands Lion ?the highest civilian order in the Dutch kingdom. TheHubble Space Telescope was launched in 1990, and has been visited by astronautsfive times in 20 years for repairs or upgrades to its systems. Cheung'sknighthood marked the first time that the Order of the Netherlands Lion hasbeen awarded to a native-born citizen of Aruba. The honor has been conferredupon eight people so far this year. Cheungcompleted his undergraduate studies at Worchester Polytechnic Institute in Worcester,Mass., and followed up with a Ph.D. in robotics from Yale University in NewHaven, Conn. During this time, Cheung completeda summer internship at NASA's Kennedy Space Center in Florida. Recognizingthat Goddard was emerging as a hub for building flight hardware, Cheung later movedto Maryland to take part, according to a NASA profile. In1996, Cheung joined the Hubble Space Telescope development team and began workon such critical systems as the HST Orbital System Test and the Near InfraredCamera and Multi-Object Spectrometer cryogenic cooler. Allthe while, he continued to give guest lectures at schools and universities inAruba. InMarch 2002, Cheung's outreach efforts expanded even more with the launch of theASCS/NCS Relay Unit Breaker Assembly or "ARUBA" box on the spaceshuttle Columbia's STS-109 mission to service the Hubble. Bynaming the device after his country, Cheung captured the attention of thenation and generated public interest in technology and science in the process.? "Ithad a critical function to correct a fault that could compromise Hubble,"Cheung said of the servicing mission in a statement. "The crewwould be handling and interfacing with this box during installation. They wouldsay the word 'Aruba' in space ? perhaps for the first time." Citizensof the island nation watched and cheered when Columbia astronaut John Grunsfelddeclared the installation of ARUBA on Hubble a success. Cheungdescribes the telescope as an ambassador of science and technology to the entire world. "Outsidethe walls of a NASA center, far away in a country like Aruba, NASA's brand isvery strong, and we have a lot to be proud of," Cheung said. "I wantus to know that our work is important and that we should derive inspirationfrom that, just like many who are deciding their careers derive inspirationfrom NASA." Cheung hassaid his family is a strong reminder of the importance of his work. "Lookingat my kids, who are extremely keen on astronomy, makes me realize what an amazing legacy Hubble is," he said.